Nearly everyone is looking for a mentor at some point in their career, but it often seems difficult to find one. It doesn’t need to be. 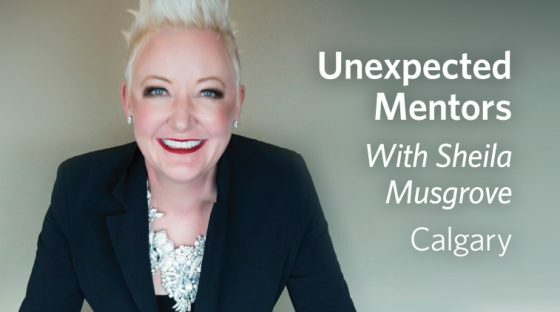 Join fellow UBC alumni in Calgary for a lively keynote with award-winning Canadian recruitment firm owner and international best-selling author Sheila Musgrove. She will redefine mentor/mentee relationships and will share 17 creative ideas of where to find your unexpected career mentors. Following the keynote, you’ll have the opportunity to mix, mingle, and make some new connections at the networking reception. Each ticket includes a copy of Sheila’s latest book, Unexpected Mentors. Questions? Please contact Julia Levasseur at julia.levasseur@ubc.ca or 1-855-427-5767. Sheila Musgrove started TAG Recruitment in 2005 with an IKEA desk, bargain website, and a computer monitor as big as a fish tank. TAG has grown into a thriving multimillion dollar organization with a strong reputation for finding stellar talent—all from an uber funky office, with a disco ball and a gong. Her mantra is “some is good, more is better”, which applies to running, the amount of jewelry worn, heel height and laughter. She loves all things that sparkle and really thinks she’s a lot taller than she is! Yes, she can run quite easily in heels and recently completed her second half marathon (in runners) with more races to come. She received her BA from the University of Calgary. Sheila has received numerous awards including the 2017 Alberta Venture ranking of Alberta’s fastest growing companies – TAG has appeared 6 times on the list. Profit and Chatelaine rank Canada’s Top 100 Women Entrepreneurs – she’s appeared on the list 4 times. She was honoured to be recognized by Red Deer College as their Distinguished Alumnus of the Year in 2015. Her first book, Hired! How to Get The Zippy Gig. Insider Secrets from A Top Recruiter. hit the Amazon Best-Seller lists in both Canada and the USA within the first 24 hours of being released. Indigo-Chapters contacted Sheila directly to ask if they could host the book on their on-line store. She of course jumped at the opportunity! Her book is available in several Indigo-Chapters in Calgary, Red Deer, Vancouver and Ottawa. Sheila has been interviewed on CTV Morning Live (Calgary, Ottawa & Vancouver), Global Morning Calgary, 660 & 770 radio. Canadian Living magazine profiled an article in September with her job search strategies. Since publishing, she’s delivered sessions at the National Cannexus (career educators) conference, CAUCUSS conference, Chic Geek’s Geeky Summit Conference, CFA (Chartered Financial Analysts), Airdrie Chamber of Commerce, Entrepreneurs’ Organization, National Women’s Executive Network, University of Calgary Alumni, U of C Haskayne School of Business, Calgary Economic Development, MLA Greg Clarke’s constituents, Red Deer College Donald School of Business, UBC Sauder School of Business, Lakeland College, SAIT, Portage College, Olds College and a funny and engaging convocation address for the graduating students of Red Deer College. She also just finished delivering a 3 hour webinar series for career educators on the ”Hired!” methodologies. It was attended by 89 companies in 4 countries! Are you living in Calgary but not receiving event invitations? We may not have your current address.